Farmer’s markets are an excellent way to supplement your normal grocery shopping with delicious, local produce. Let PBS Food help you find a farmer’s market in your area with our “Farmer’s Market Resource Page.” Check out the listings below, and help us grow this list by adding other online listings of your local farmer’s markets in the comments section! United States Department of Agriculture (USDA): The USDA keeps a self-reported, searchable database of farmer’s markets that allows people to search by zip code/state, products available, payment accepted, and type of area. Local Harvest: This organization focuses on local and organic food. Their listings are listed alphabetically, but you can also search by zip code or state if you do not know the exact name of a farmer’s market. Local Harvest also lists small farms and general local food sources as well. 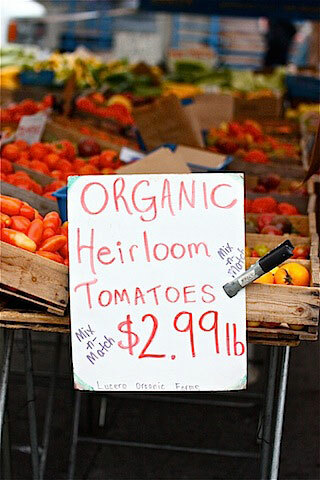 Farmer’s Market Online: True to it’s name, this website is structured similar to an open-air market for the internet where real vendors list their food, products, and other crafts available for sale. Jenna Weber of Fresh Tastes shares with PBS Food one of her recent trips to a farmer's market near her. California (state-wide): The California Certified Farmer’s Markets compiles a listing of all farmer’s markets across the state that allows you to filter by city, county, region, and vendor. Hawaii: Kauai is just one of the Hawaiian islands, but offers severals farmer’s markets to support local food. Massachusetts (state-wide): PBS member station WGBH has a county-by-count listing of farmer’s markets across Massachusetts, which even includes times and exact locations. New York City: GrowNYC is a non-profit that strives for create a more environmentally-friend New York City. Their website includes a complete listing of markets in the city as well as the surrounding boroughs. Philadelphia: The Food Trust operates over 30 farmer’s markets across the Philadelphia area. Washington, D.C.: FreshFarm runs farmer’s markets across the D.C.-metro area, which includes parts of Maryland. Help us grow our list! If you have any links to farmer’s markets in your area, please leave them in the comments section, and we will add them to the list.